Contested on roads between Santa Rosa and San Agustin, stage four of Rally Argentina went dreadfully wrong for the Citroën Total Abu Dhabi World Rally Team. Caught out by the same rock, Kris Meeke/Paul Nagle and Craig Breen/Scott Martin were forced to retire for the day. - Rally Argentina began on Thursday evening with a super special stage held in the streets of Córdoba. After a night spent in parc ferme, the cars headed south on Friday morning for the first proper gravel stages. - On SS2, Kris Meeke moved into second place overall. The Briton confirmed his good form on the next stage, staying within ten seconds of surprise leader Elfyn Evans. On his first appearance at Rally Argentina, Craig Breen held eighth position in the second Citroën C3 WRC. 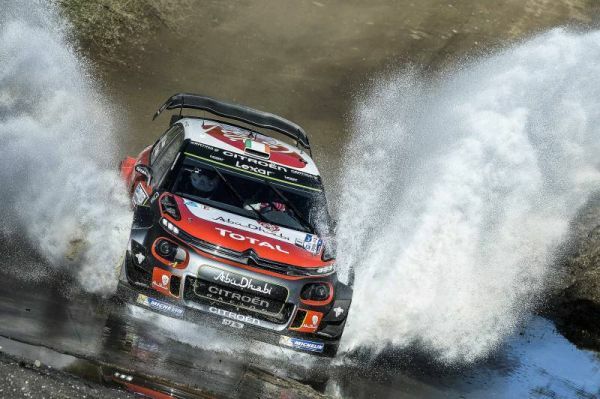 - Expected to be one of the event's decisive stages, the Santa Rosa – San Agustin speed test proved to be an unhappy experience for the Citroën drivers. First of all, Craig Breen hit trouble after a heavy landing. The impact of an exposed bedrock against the underbody of the car damaged the gearbox, leaving it stuck in fifth gear. - Two minutes later, Kris Meeke was launched into the air… at exactly the same spot! He lost control of the car, which went off the road and was thrown into a roll. Despite this off, he managed to get going again. - Both cars eventually made it to the end of SS4, but lost several minutes in the process. With substantial mechanical damage, the C3 WRCs retired on the next road section. - Once back in service, the Citroën cars were examined by FIA officials, who authorised repairs with a view to the crews returning under Rally2 rules. - Kris Meeke/Paul Nagle and Craig Breen/Scott Martin will therefore be back in action tomorrow. Day two of Rally Argentina will feature six stages and 160 kilometres of competitive action. "It is difficult to be positive after a day like today. Having both cars retire is especially frustrating, because it has happened at an event where Citroën has always done well in the past. Having said that, we have an aggressive approach, as we start each rally with the aim of trying to win it. That means that some risks are taken and sometimes, there can be a element of frustration. We are going to try and understand why both our cars suffered a relatively similar fate at the same place." "This fourth stage turned into something of a nightmare for the team, since both cars were forced to retire at the same time. It's a shame because before that, my pace was good and I was holding second place behind Elfyn. Then we were surprised by this bump in the road: it just launched the car and I couldn't regain control before the next corner. We hit the bank on the outside of the corner and rolled. It wasn't a massive crash, but it did a lot of damage to the car." "Right from the start this morning, I had moments in several places, the road surface was just so difficult to judge. I wasn't pushing that much, but I knew that's what I neede to do and stay patient. On the fourth stage, I was caught out by this compression on a fast left-hand corner. The bottom of the car hit the ground hard and that damaged the gearbox. We tried to keep going to make it to service, but oil leaked out and we had to retire. We'll be back tomorrow to keep picking up experience."